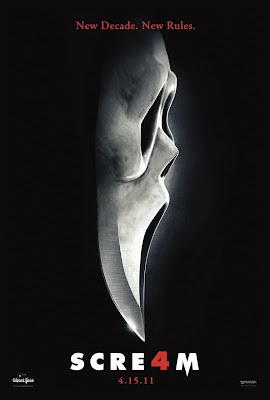 I just love the way SCREAM 4 Re-invented and Re-incarnated this SLASHER Franchise that made a cut and a trend among all other genre-related films. I mean, I really admire the prowess of Wes Craven in such franchise and outfit. Considering, from a disappointing SCREAM 3, about 10 years ago, here comes the MODERNIZED VERSION of the film that changed the concept of SUSPENSE and THRILLS. I heard and read many bad reviews about Scream 4. But, in fairness, it received a ABOVE AVERAGE Rate in the Tomato Meter. Maybe, they were expecting too much. But I think, SCREAM 4 is as good as its own FORMS. Yes, it is a SUSPENSE FILM, but adding humors and clever kills, will make SCREAM MOVIES at par with any other. I think the film's strength lies to its CHARACTERS. Sydney is back along with Gale Weathers and Dewey Riley. It is so refreshing to see the 3 Original Casts of the Trilogy back and reunited after 10 years. The caliber is still there. The film may show age among its predecessors, but Scream 4 Re-Invents the plot into a whole new level and depth. Other characters just like Hayden P. and Emma R., and others, were also a good addition to the cast. Bringing spice and crisp to the modernized version. Scream 4 may have flaws in its genre but Craven's spark will always be there. Leaving you an impression of whose the killer plus clever kills and humors that were indeed a SCREAM FRANCHISE MARK. The whole plot revolved around the life of Sydney after 10 years and now that she is back to Woodsboro, where it all began. The cinematography of the film was good. Killing Scenes are okay, far better compared with the old franchise death scenes. What made it good is a twist of modern techniques especially in the scenes where you here Scream's Scratchy voice. The twist was more or less predictable but wasn't obvious at all.I wasn't expecting who the killer was. The plot will somehow bring you in a merry-go-round mode and having some chills and thrills, but it is just a quarter of what SCREAM MOVIE nowadays has to offer. I am expecting much actually. But, on its own terms, SCREAM 4 is way above the cut. For me, it satisfied my hunger for SLASHER/SUSPENSE/THRILLER film that has a twist of meta humors and re-invented plot schemes.